There are dozens of ways to keep your home clean that won't impact your health or the environment and don't require professional green cleaning services. Chances are you already have most of what you need lying around the house. Everyone in the house uses the bathroom multiple times a day, which means dirt and grime can build up quickly. But it doesn't have to. Just head to your fridge or pantry and grab a few items like citrus fruit, salt, and vinegar. 1. The bathtub or shower can be one of the hardest places in your entire home to keep clean, but it makes sense considering that's where we go each day to clean ourselves. Try slicing a grapefruit in half and sprinkling kosher salt on top. Rub it along the sides of the bathtub to remove dirt build-up. 2. Grout can be difficult to clean, and it gets dirty before you know it. A little elbow grease goes a long way in removing grout stains but try adding some vinegar and baking soda. You may also find that a steam cleaner does the trick. 3. Every time you use your toilet brush, spray it with vinegar afterwards to keep bacteria and germs at bay. You can prop it under the seat to let it dry. 4. Say goodbye to streaks on mirrors and windows with this green cleaning solution. Simply add half a cup of rubbing alcohol to one third cup of distilled vinegar in a spray bottle. Fill the remaining amount with distilled water, and store it at room temperature. 5. If you have difficult stains on your bathtub or sink, make a paste of equal parts baking soda and cream of tartar. Add a little lemon juice to the mix, and spread it on the stain. Let it sit for 30 minutes before rinsing. Repeat as necessary. If you think your bathroom is dirty, just picture all the germs that build up in your kitchen over time, especially if you cook and eat at home often. 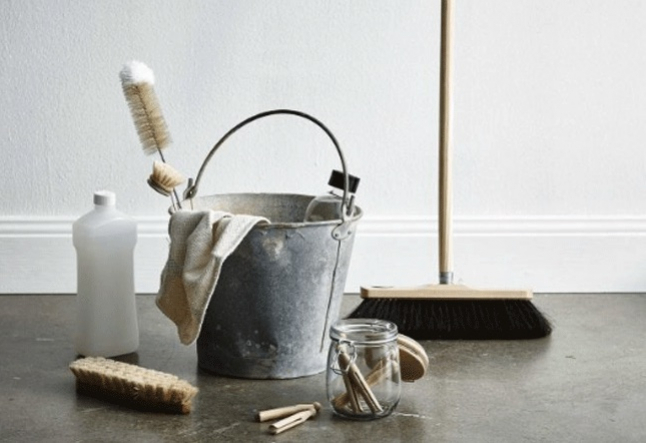 The good news is that there are so many environmentally-friendly cleaning hacks for everyone's favorite spot, you will have it spotless in no time. 1. Create your own all-purpose cleaner by filling a glass jar with orange peels. Pour distilled vinegar over the top, and let it soak for about two weeks. The wait will be worth it. Pour the finished product into a spray bottle and keep it around for general kitchen cleaning (note: this general cleaner may not be suitable for all surfaces; always test an inconspicuous area first!). 2. If you have stainless steel appliances, you know they get dirty quickly. Remove smudges and fingerprints with a drop of olive oil applied to a soft cloth. After you finish, flip the cloth over and rub it with the clean, dry side. For an extra shine, sprinkle some flour on the surface and with a little elbow grease, scrub it with a soft cloth. 3. Over time, food particles and other gunk build up in your garbage disposals and drains, which can lead to an unpleasant scent. Start by cleaning the sink hole with a toothbrush and following up by pouring about half a cup of baking soda down the drain. Next, pour a cup of vinegar right behind it. After a few minutes start running the hot water, and put some lemon peels into the disposal. Turn it on, and soon, your kitchen will smell lemony fresh. 4. If you have food or odors lingering in smaller appliances like food processors and blenders, simply fill them halfway with hot water. Squirt in a few drops of lemon juice, and let them run for a minute or two to freshen things up. Your bedroom is your sanctuary, which means keeping it fresh and clean at all times is a must. Believe me, you will sleep better. 1. Next time you wash your sheets, give your mattress a little refresher, too. Sprinkle baking soda across the surface, and let it sit for an hour. Vacuum it up with your vacuum cleaner's upholstery or mattress attachment. 2. Keeping dust off your blinds can be a real pain, but this little trick makes it easier than ever. Combine equal amounts of water and distilled vinegar in a spray bottle, and lightly spray your blinds. Put an old sock over your hand, and wipe them down. 3. Another place in your home that gets dusty quickly is your TV (and computer) screen. Skip the cleansers and dust it with a coffee filter, which will help pick up the lint. 4. Keep your bed, dressers, and nightstands shiny and clean with homemade furniture polish. Just mix the juice of one lemon with a tablespoon each of water and olive oil. Once blended, dip your cloth into the mixture and start wiping. Everyone is always looking for a way to make doing the laundry a more natural process. While there are eco-friendly cleaning companies out there, you can actually start at home. 1. There are dozens of homemade laundry detergent recipes available online. The best thing to do is experiment and see which one you like best. One of my favorites includes shaving three bars of coconut oil soap and combining it with six cups of soda crystals. Use two to three tablespoons every time you wash a load. For scent, add an additional 5 drops of lemon essential oil to each load. 2. Replacing your fabric softener is as easy as making a ball out of aluminum foil and tossing it into the dryer with a load of clothes. Best of all, you can use it over and over again. I hope you found these simple and effective green cleaning tips useful. Please share this article with your friends and family if you think they’ll enjoy the read too!